A combination set of tsukemono, or pickled vegetables, from Tatsuo Umemiya's Tsukemono Store. 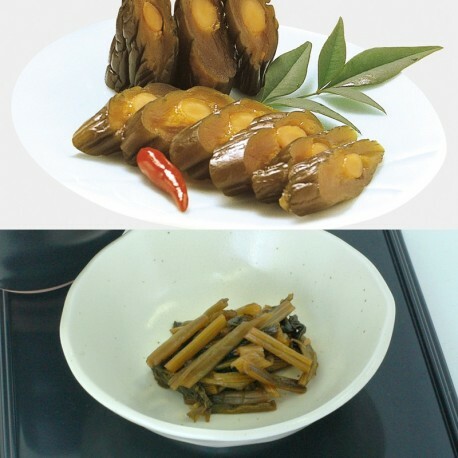 Pickled cucumbers stuffed with yama gobo and flavored with special soy sauce. The No.1 seller of Tatsuo Umemiya's pickled vegetables. Cut diagonally in about 1cm and enjoy. Pickled nozawana vegetables flavored with special soy sauce. The vegetables are sliced and does not require extra preparation.